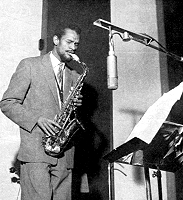 By March 1958, Joe Harriott was in a position to form a regular quintet and to develop his own policies as a group leader. For his first conventional quintet he enlisted Hank Shaw (trumpet), Harry South (piano), Coleridge Goode (bass), and Benny Goodman (drums). After a fifteen day residency at the Storyville Club in Frankfurt during April the group returned to London and played regular Sunday afternoon sessions at the Star Club in Wardour Street. In July they began a long residency at the Marquee in Oxford Street which, with a few breaks, lasted for well over five years. The music of the 1958 quintet was essentially solid, swinging hard bop. In no sense was it original relying on a repertoire of Horace Silver tunes and Harriott's own themes in a similar vein. It was honest and warmly emotional jazz and the fans loved it. However, just as the quintet began to settle down, disaster struck. On August 25th Harriott collapsed and was rushed to hospital suffering from bronchial pneumonia, pleurisy and a lung infection. He remained bedridden for three and a half months. Coleridge Goode took over the leadership of the group at the Marquee and baritone sax player Harry Klein temporarily stepped in to replace Harriott. While absent from the jazz scene Harriott wrote some music and contemplated his future musical direction. On January 30th, 1959 he returned to the Marquee. Bobby Orr had by now replaced Benny Goodman on drums. In February the group went to the San Remo Jazz Festival, topping the bill on the first day and were a major success.The quintet was one of the bright spots of the 1959 British jazz scene and the group made their first record a 7" extended play record with four straightforward, not particularly memorable blues titles. Senor Blues/Still Goofin'/Count Twelve/Jumpin' With Joe. In October 1959 Harriott was abroad again at the Storyville Club in Frankfurt with Chet Baker. In November he supported the Modern Jazz Quartet on their British tour. In 1960 Harriott re-formed the quintet, replacing Hank Shaw with Shake Keane (who also played flugel horn), Pat Smythe replaced Harry South. The new group was to play 'free form' jazz - music without set harmony or rhythm, sort of abstract pieces. This was Joe Harriott's own music, based on his dual interest in composition and philosophy in which his thinking became more and more dominated by the concept of the 'abstract'. The music was unlike the other free jazz being developed by Ornette Coleman in the USA which still had rhythmic links to convential jazz. Harriott's abstraction used silences as well as one player improvisations without rhythm or harmony. The 'free form' compositions were group performances with few conventional solos with due weight to all the members of the group, interaction and interchange dominated the proceedings. They made their first record in April 1960, two tracks being released in the UK on an extended play record. Four titles were issued on a Jazzland LP. Joe Harriott (as), Shake Keane (tp), Harry South (p), Coleridge Goode (b), Bobby Orr (d), Frank Holder (bgo*). Caravan(1)*/Liggin'(1)/Southern Horizons/You Go To My Head/Tuesday Morning Swing. By now the audience at the Marquee had heard the 'new music' and the reception was mixed, the Joe Harriott Quintet became the most controversial group on the London jazz scene. The group had to appeal to the paying public and for economic reasons they played mainly post bop conventional jazz in the club with a sprinkling of 'free form' pieces. There was little doubt as to where Harriott's real interest lie. The three LPs of 'abstract music' that Joe made (Free Form, Abstract and Movement) over the next three years are considered by many to be the peak of his musical career on record. Phil Seamen had replaced Bobby Orr on drums for most of the albums and the group's methods became more adventurous with the passing of time. The music was not to everybody's taste, it had come too far from conventional jazz for many people. With it's use of strings of short fierce stabbing notes, it's dispensation of fixed tempos or harmonies and collective spells of group free improvisation or silence it left many listeners baffled. Joe Harriott (as), Shake Keane (tp), Pat Smythe (p), Coleridge Goode (b), Phil Seamen (d). Joe Harriott (as), Shake Keane (tp), Pat Smythe (p), Coleridge Goode (b), Phil Seamen (d), Frank Holder (cga,bgo). Joe Harriott (as), Shake Keane (tp), Pat Smythe (p), Coleridge Goode (b), Bobby Orr (d). Movement/Morning Blue/Beams/Count Twelve/A Face In The Crowd/Revival/Blue On Blues/Spaces/Spiritual Blues. Home Sweet Heaven/If I Have You/Go Into Your Trance/You'd Better Love Me/I Know Your Heart/Was She Prettier Than I/Forever And a Day/Something Tells Me. The session detailed below was the last that Harriott made with a quintet and marked a return to free-wheeling post bop jazz that Joe had started out with. This page was last updated during September, 2008.